I want to share with everyone the product I use that has truly changed my Halloween costume making and has made anything possible. After years of experimenting with paper mache (too heavy), wire and fabric (not stable enough) and many other methods, I finally found plumbing pipe insulation. This is extremely light weight, bendable, sturdy when glued into forms and is really inexpensive. All you need is a little imagination, some pipe insulation, lots of hot glue and time! Our dog Sawyer just turned a year old and is a very big part of our family. I wanted to make a costume for him that was special because he is so very special to us. 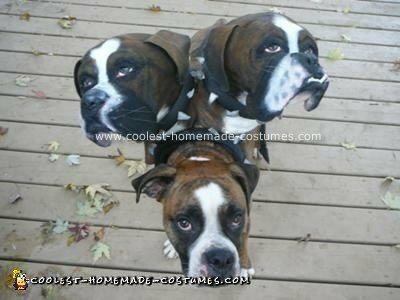 In the past I have used Greek Mythology for inspiration when making my children’s costumes and decided I would make my dog a Homemade Cerberus Costume, the three headed dog that guards the gates of Hades. Initially I was going to make the other heads with snarling faces but decided to do faces that resemble my dog. Quite often his teeth get stuck on his lips. I began with rough measurements of his head. I attached two Styrofoam balls with a small piece of dowel and began to form a rough head shape with strips of pipe insulation. The trick is to use very little hot glue as it will melt the insulation. I used small clamps to hold the materials in place while it sets. The original form looked king of like a turtle but as I added the strips to fill in the spaces, the dog’s head began to take shape. I used craft foam to make eyelids and teeth and added strips of insulation around the base to form the necks. I covered the heads in felt and painted them using acrylic paint. For whiskers I cut off bristles from an old paint brush and glued them on. I used a small piece of wire to attach the two heads together and then added extra felt to cover the harness that the heads would Velcro too. To make the harness I used strips of pipe insulation covered in fabric. One strip for a collar that Velcrod at the front and at the side. I attached them together with a strip that runs along my dogs back. To make a tail I used a long strip of insulation and put triangles to form ridges and a point at the end. I attached this to the harness. I made collars for all three heads using plumbing insulation for the collars and spikes. I painted the collars black and the spikes silver. The heads ended up being bigger than my dog’s head so I should have made the initial forms smaller, but from what I understand his head will continue to grow until he’s three, so maybe he’ll catch up! This Homemade Cerberus Costume cost about $5.00 to make excluding paint and glue which I already had. It took 4 nights to complete. This is an absolutely amazing costume for such a cute doggy! The detail is incredible and by far the best I have seen so far! This costume has exceeded anything that I have ever seen in a homemade costume. Wow I truly am lost for words it is amazing and I would have to agree with another users comment especially on such a cute dog. This costume is out of this world and the dog heads look real (yep OK I know one of them is real I know), but which one!). Seriously though Congratulations Tracey on producing such an amazing costume, it is quite literally a walking work of art! keep up the good work and I look forward to seeing more from you and thank you for providing such an insight on the materials that you use. AMAZING! AMAZING! AMAZING! I still cannot get over how amazing this costume is!!!!! I am looking through the Your pet section and notice you have more…You are amazing! Wow!! They look so real. When I saw the first straight-on photo, I thought “big deal, he just glued two life-size photos of his dog’s head on cardboard”, then I saw the following photos! You did an amazing job fabricating the heads to look real! Thanks for the great description and photos; now I’m looking forward to seeing what I can do with the foam! Thanks for sharing your ideas and talent with us! Your work is amazing. Lucky dog! this costume is simply amazing! i never would have though of being able to manipulate the pipe insulation foam this way. excellent job! Fantastic! Awesome and Genius! So Cool! We Love it! 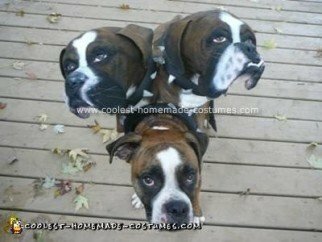 This is absolutely the best dog costume I have ever seen. Thanks so much to everyone who commented on my costume. I think you should have won. Do you think this could easily be done for a cat too? The great thing about using the pipe insulation is how very lightweight it is. I have made very large costume heads for my children that look very heavy but they can easily be held between two fingers with little effort. If you have the patience to work on a smaller piece like a cat head,and if your cat is laid back enough to wear it, then yes you could absolutely use the same method. Remember to use low temperature hot glue.Thanks for your comment. Super job on the crafting and painting… what did you do this year? Thanks so much for the comment. This year I was crazy busy making costumes for my children and a lot of dogs. I made sawyer a doggy version of Edward Scissor Hands….Sawyer Scissor paws. Thanks for sharing this! You are an amazing and creative artist! And your dog is BEAST! Elisa and Kerry… Thanks so much for your kind comments, I appreciate them! OMG! You should consider having a shop on etsy or something (my apologies if you already have one of which I’m unaware). I would totally pay to have my dog in a costume like this! Bravo! Kristin, I just saw your comment, not sure when you posted it, sorry. I don’t have a shop on Etsy but wanted to thank you so much for your kind comment. Are you interested in turning this into a cottage industry? I would happily pay you to do my Golden Retriever.